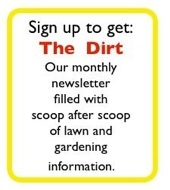 If you thought you took care of your crabgrass problem last summer, you may have a surprise in store soon. Once crabgrass emerges, it drops seed pods that lay dormant for the next year. Killing the visible crabgrass with MSMA or Q4 Plus does not affect these dormant seed pods. 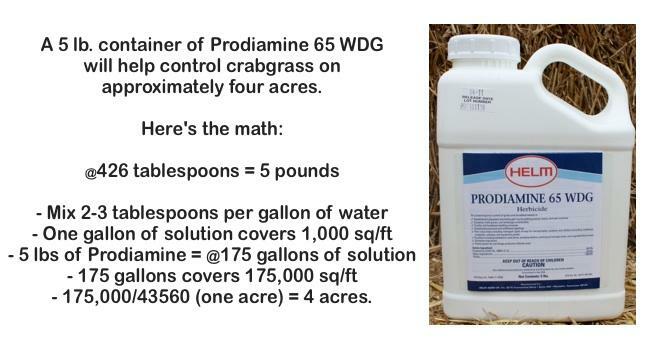 The only way to break the cycle is to control pre-emergent crabgrass and many other noxious weeds with Prodiamine 65 WDG. 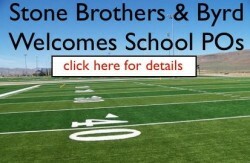 Put down Prodiamine before the crabgrass emerges and you will be on your way to cleaning up the crabgrass problem. While you should always follow all label directions and precautions, you can use the general rule of thumb mixing rate chart below for an idea of how much area you can cover. This entry was posted in Uncategorized and tagged pre emergent herbicide, prodiamine. Bookmark the permalink.